So much of my baking and cooking inspiration comes from other bloggers. While I spend plenty of time on Pinterest, Yummly (my new favorite), or flipping through cookbooks, if there is a something specific I am looking for, I often head to my favorite bloggers sites. That was the scenario when I was looking to make a new bean dish a couple months ago for when we were having company over. I didn't want the traditional saucey baked beans. Maybe I should play it safe more often, but I don't! I ended up finding something new and different (to me anyway) at A Southern Grace. We loved this recipe, and I can't tell you how many times we have made it since. We have tweaked it a bit to suit our taste. The name of this dish? Well, I name a lot of my dishes after the blogger where I found the recipe. It helps me keep track of where that recipe came from. Like Mary's Peppercorn dressing and Mandy's Goulash. Now, we have Grace's Baked Beans. I love all the different beans in this dish. Butter beans always make me happy, can't tell you why, but they do. But, it's the dried spices that really what set this dish apart from others, they take the beans to a different level. We especially love cumin in our dishes, and it works perfectly with these beans. They have such a "Southwest" flavor, that any chili/cumin rubbed meat would be a great main course for this side. Preheat oven to 350 degrees. Mix all ingredients in large mixing bowl. Transfer to baking dish and bake for approximately 60 minutes or until desired consistency. I am a huge fan of baked beans and all things legumes. This looks terrific! Yum! Pinning this! It looks fantastic, thanks for sharing!!! Yummmiieee! Looks and sounds fantastic and delicious! Have to try it. Thank you for the recipe! 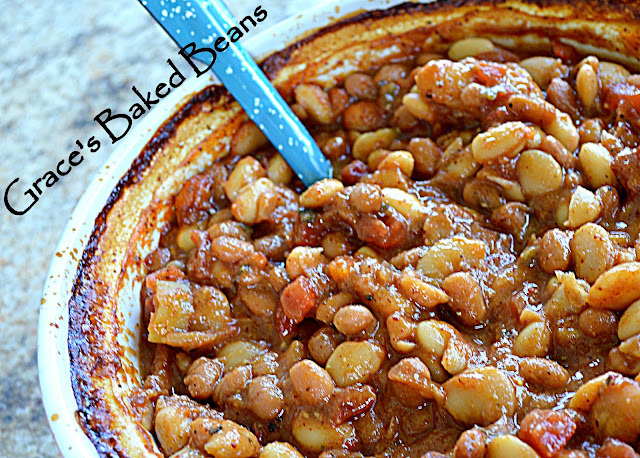 I love baked beans, I make a version of this but it has hamburger in it and we call it calico beans. I love this recipe though, I cannot wait to give it a try! I would love for you to stop by the Throw Back Thursday link party and share some of your posts. I pin and pin but I don't think I've made anything from my pinterest boards. I wonder why. This looks good. I had to giggle at Amalia's comment :) I know what she means about pinning and pinning. This looks amazing, my friend. You always share fabulous recipes. Hugs! Oh, these look amazing! Pinned, and might even try making these this weekend! Thanks!